Victor’s art education started when he was old enough to hold a crayon. That education continued through college with a degree in Fine Arts from Texas State University in San Marcus, Tex. He is a certified art teacher and taught several years in the Dallas school system. His focus turned toward portraits where he studied for 10 years under one of the most prominent portrait artist in Texas. Inspired by the famous James Tennison and Phil Boatwright. Victor honed his skills and is able to transfer those same skills and techniques from painting children to painting beautiful flowers and stunning wildlife. Victor believes “If it lives, it should be painted and then it will live forever”. 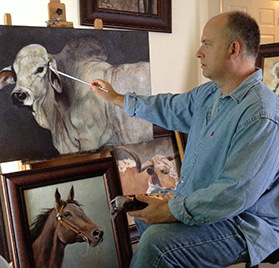 Using the old masters techniques he learned in Art History, he mixes impressionism with a heavy dose of realism that produces a life like image of his subjects. Victor now resides in Dallas, Texas near his family. He works out of his home studio and participates in art festivals, local galleries and teaches art classes at local art council.